Apparently, something about the words “rest” and “trench” resonates with you. I bet it is more the word “rest” that sounds appealing. You desire to have a deep rest, a deep peace, in your soul. But it seems elusive. But rest doesn’t come without the trench. Believe it or not, they go hand-in-hand. Growing in rest is a process. I have no simple steps for you to follow and magically feel restful. No, you must commit to pursuit. In order to grow, you must be willing to ask yourself a few difficult questions. I do not want to be in a battle. But to be at rest, I must acknowledge reality. My desired picture of our days at home is anything but warfare. Yours probably isn’t either. But the battle wages whether we acknowledge it or not. This is a battle that began in the Garden of Eden and will wage until Jesus wins the final victory. It is a battle in heavenly places, but it is also in my home each and every day. It might seem the battle is laundry piles, mounds of dishes, sticky floors, sibling squabbles, reluctant learners, disobedience, selfishness. But those are just the external manifestations. Our battle is not against flesh and blood (Ephesians 6:12). Have you ever noticed this verse follows Paul’s instructions about relationships? (Read Ephesians 5) Hmm, chew on that thought for a few minutes. The real battle is for my children’s souls. It is a battle for my own soul. When you observe the external battles in your home, do you see the hidden battle? Selfishness, pride, division. They seek to defeat you. They are tools of the enemy who seeks to steal, kill, and destroy everything good in your home. To foster rest in your soul, you must first acknowledge a hard truth. You are in a battle. Yes, this is hard. It might appear to be a battle of sibling rivalries; but really, it’s the hidden battle of spiritual forces. So, really. 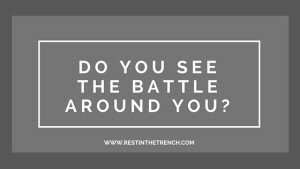 Do you see the real battle around you? Several years ago, I began praying that God would give me a single word upon which I could focus for the year. It seemed like He whispered to me words such as quiet and peace. 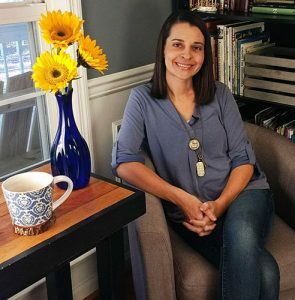 Then I was introduced to teachings in the homeschool community about teaching from a state of rest. My word became evident: REST. I began to ponder what life would be like if I did everything from a state of rest. Parent from a state of rest. Plan from a state of rest. Lead from a state of rest. Clean from a state of rest. A soul at rest remains calm despite external circumstances. A soul at rest is not anxious, frantic, or fearful. A soul at rest knows that Jesus has already won the battle and lives out of that belief. That is how I want to live! Daily life can become so full that we are unaware when we are not at rest. If you are like me, then you can go through the entire day without ever stopping to think. But our soul is helpful and gives us cues as to whether we are living in rest or not. Anxiety, fear, despair, and worry all seem like bad emotions. And yes, they are. But, they become gifts when we allow them to give us cues that we are off course. If we will listen, they can be the catalyst to get back on track. When I use the word soul, I am referring to your heart (emotions) and your mind (thoughts). Your emotions and thoughts are your cues to whether or not your soul is at rest. Ask yourself: Is my soul at rest? 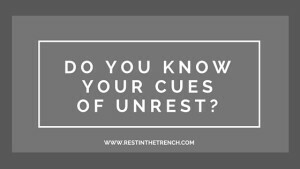 What cues are my emotions and thoughts giving me that I might not be at rest? To foster rest in your soul, you must recognize your own warning signs and admit a hard reality. You can’t really foster rest in your soul until you recognize your need for rest. Do you know your personal cues for when you soul is not at rest? There is a real tension in the ideas of battle and rest. How can God be calling me to both of these at the same time? The answer comes from ancient days when Joshua gave his parting words to the Israelites. Did you catch his instruction? You are to CLING to the Lord your God. Joshua’s concern was that the people not be drawn in to the idolatry of the land around them. God had brought the Israelites into the Promised Land, delivered them through many battles, and given them rest. If they did not cling to God, they would surely default into the ways of the culture around them. It is no different for us. If we do not intentionally pursue rest in God alone, we will default to pursuing rest the way our culture does. And honestly, is there much rest at all in our culture? We can rest in the midst of the battle by clinging to Jesus. There is no rest when we pursue rest anywhere besides Jesus Himself. He has extended a personal invitation for you to cling to Him. “Come to Me…and you will find rest for your souls.” So that’s the final question to ask yourself. Cling means “to hold tightly; to grasp”. My youngest sister was only 7 when I left home for college. When I went home for a weekend or holiday, she did not want me to leave. I remember standing in the driveway by my car holding and hugging her, arms and legs tightly wrapped around me. She was not going to let go. My mom had to peel her off me so I could leave. All of us were in tears. But that is clinging. Holding on no matter what, refusing to let go. You have probably seen this in your child. Perhaps your child has clung to you in the middle of the night after a bad dream. Perhaps they have clung during a pediatrician’s visit. Perhaps they have clung at the edge of the ocean. Perhaps they have clung when being dropped off at a nursery. Fear. Pain. New experience. Children follow their emotional cues to cling to the one they trust. Do you allow your cues to lead you to cling to the One you trust? 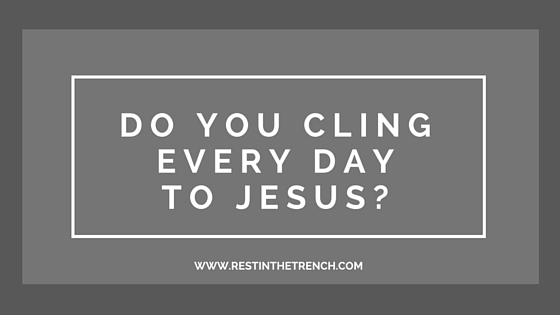 So what does it actually look like to cling to Jesus? To cling to Jesus, I seek Him first. This does not mean I check off “morning quiet time” on my daily to-do list. It does mean I talk with Him early, then I continue talking with Him throughout the day. When my soul is not at rest, clinging usually looks pretty messy. In the midst of family and personal struggle, clinging often involves tears. Many tears sometimes. Messy tears. The day’s events are likely not the beautiful plan I imagined. It might be a day I tell God that, really, this time, He has allowed more than I can bear. But I refuse to let go of Him. On my bathroom floor in the midst of tears, I pour out my heart to my Jesus. He can handle it. At my kitchen sink in the midst of tears, I play the same worship song over and over and over, refusing to let go. If I sing the words of worship enough, I eventually remember to believe what I know is true. He can handle whatever I am enduring. I stubbornly hold on and refuse to let go. Are you willing to take an honest look at yourself? Are you willing to rest in your trench? Are you willing to commit to the pursuit of Jesus, because that is really the pursuit of rest? If you want to live with a heart at rest, you must begin with these questions. 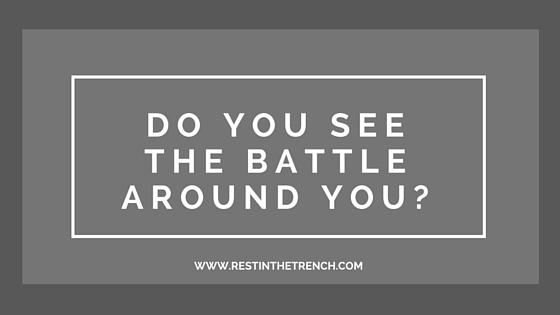 Do you see the spiritual battle in the midst of your daily battles? It is waging whether or not you realize it. 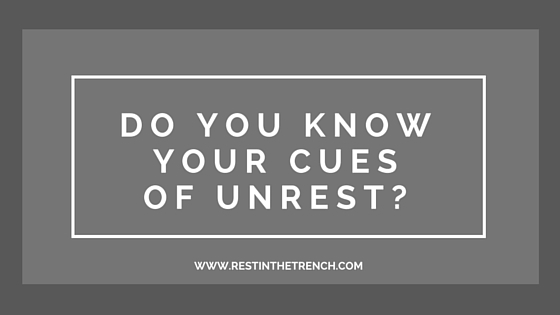 Do you know your cues, your warning signs, when you soul is not at rest? You cannot foster rest unless you recognize your need for it. 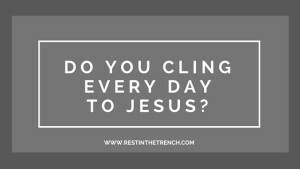 Do you cling daily to Jesus? That is our only hope for truly living with a restful heart in the midst of busy, messy lives. Am I leaving you a bit frustrated today? Are you wondering how to actually do this? Don’t worry, and please don’t give up on pursuing rest! I am all about making the spiritual ideas practical in our daily lives. Tomorrow, we will look more at how to actually cling to Jesus. For today, draw just one step closer to Jesus.